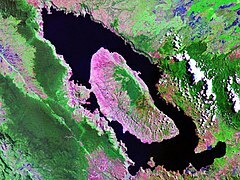 The Toba supereruption was a supervolcanic eruption that occurred about 75,000 years ago at the site of present-day Lake Toba in Sumatra, Indonesia. It is one of the Earth's largest known eruptions. The Toba catastrophe theory holds that this event caused a global volcanic winter of six to ten years and possibly a 1,000-year-long cooling episode. Lake Toba is the resulting crater lake. In 1993, science journalist Ann Gibbons posited that a population bottleneck occurred in human evolution about 70,000 years ago, and she suggested that this was caused by the eruption. Geologist Michael R. Rampino of New York University and volcanologist Stephen Self of the University of Hawaii at Manoa support her suggestion. In 1998, the bottleneck theory was further developed by anthropologist Stanley H. Ambrose of the University of Illinois at Urbana–Champaign. Both the link and global winter theories are highly controversial. The Toba event is the most closely studied supereruption. The Toba eruption or Toba event occurred at the present location of Lake Toba in Indonesia, about 7012236682000000000♠75000±900 years BP according to potassium argon dating. This eruption was the last and largest of four eruptions of Toba during the Quaternary period, and is also recognized from its diagnostic horizon of ashfall, the youngest Toba tuff. It had an estimated volcanic explosivity index of 8 (the highest rating of any known eruption on Earth); it made a sizable contribution to the 100×30 km caldera complex. Dense-rock equivalent (DRE) estimates of eruptive volume for the eruption vary between 7012200000000000000♠2000 km3 and 7012300000000000000♠3000 km3 – the most common DRE estimate is 7012280000000000000♠2800 km3 (about 7015700000000000000♠7×1015 kg) of erupted magma, of which 7011800000000000000♠800 km3 was deposited as ash fall. The erupted mass was 100 times greater than that of the largest volcanic eruption in recent history, including the 1815 eruption of Mount Tambora in Indonesia, which caused the 1816 "Year Without a Summer" in the Northern Hemisphere. Toba's erupted mass deposited an ash layer of about 15 centimetres (5.9 in) thick over the whole of South Asia. A blanket of volcanic ash was also deposited over the Indian Ocean, the Arabian Sea, and the South China Sea. Deep-sea cores retrieved from the South China Sea have extended the known reach of the eruption, suggesting that the 7012280000000000000♠2800 km3 calculation of the erupted mass is a minimum value or even an underestimate. Geologist Michael R. Rampino and volcanologist Stephen Self argue that the eruption caused a "brief, dramatic cooling or 'volcanic winter'", which resulted in a drop of the global mean surface temperature by 3–5 °C. Evidence from Greenland ice cores indicates a 1,000-year period of low δ18O and increased dust deposition immediately following the eruption. The eruption may have caused this 1,000-year period of cooler temperatures (stadial), two centuries of which could be accounted for by the persistence of the Toba stratospheric loading. Rampino and Self believe that global cooling was already underway at the time of the eruption, but that the process was slow; Toba tuff "may have provided the extra 'kick' that caused the climate system to switch from warm to cold states". Although Clive Oppenheimer rejects the hypothesis that the eruption triggered the last glaciation, he agrees that it may have been responsible for a millennium of cool climate prior to the 19th Dansgaard-Oeschger event. According to Alan Robock, who has also published nuclear winter papers, the Toba eruption did not precipitate the last glacial period. However, assuming an emission of six billion tons of sulphur dioxide, his computer simulations concluded that a maximum global cooling of approximately 15 °C occurred for three years after the eruption, and that this cooling would last for decades, devastating life. Because the saturated adiabatic lapse rate is 4.9 °C/1,000 m for temperatures above freezing, the tree line and the snow line were around 3,000 m (9,900 ft) lower at this time. The climate recovered over a few decades, and Robock found no evidence that the 1,000-year cold period seen in Greenland ice core records had resulted from the Toba eruption. In contrast, Oppenheimer believes that estimates of a drop in surface temperature by 3–5 °C are probably too high, and he suggests that temperatures dropped only by 1 °C. Robock has criticized Oppenheimer's analysis, arguing that it is based on simplistic T-forcing relationships. Despite these different estimates, scientists agree that a supereruption of the scale at Toba must have led to very extensive ash-fall layers and injection of noxious gases into the atmosphere, with worldwide effects on weather and climate. In addition, the Greenland ice core data display an abrupt climate change around this time, but there is no consensus that the eruption directly generated the 1,000-year cold period seen in Greenland or triggered the last glaciation. Archaeologists, led by the University of Cambridge's Dr Christine Lane, in 2013, reported finding a microscopic layer of glassy volcanic ash in sediments of Lake Malawi, and definitively linked the ash to the 75,000-year-old Toba super-eruption, but found no change in fossil type close to the ash layer, something that would be expected following a severe volcanic winter. They concluded that the largest known volcanic eruption in the history of the human species did not significantly alter the climate of East Africa, attracting criticism from Richard Roberts. Lane explained, "We examined smear slides at a 2-mm interval, corresponding to subdecadal resolution, and X-ray fluorescence scans run at 200-µm intervals correspond to subannual resolution. We observed no obvious change in sediment composition or Fe/Ti ratio, suggesting that no thermally driven overturn of the water column occurred following the Toba supereruption." In 2015, a new study on the climate of East Africa supported Lane's conclusion, that there was "no significant cooling associated with Mount Toba". The Toba eruption has been linked to a genetic bottleneck in human evolution about 70,000 years ago, which may have resulted from a severe reduction in the size of the total human population due to the effects of the eruption on the global climate. According to the genetic bottleneck theory, between 50,000 and 100,000 years ago, human populations sharply decreased to 3,000–10,000 surviving individuals. It is supported by some genetic evidence suggesting that today's humans are descended from a very small population of between 1,000 and 10,000 breeding pairs that existed about 70,000 years ago. Proponents of the genetic bottleneck theory (including Robock) suggest that the Toba eruption resulted in a global ecological disaster, including destruction of vegetation along with severe drought in the tropical rainforest belt and in monsoonal regions. For example, a 10-year volcanic winter triggered by the eruption could have largely destroyed the food sources of humans and caused a severe reduction in population sizes. Τhese environmental changes may have generated population bottlenecks in many species, including hominids; this in turn may have accelerated differentiation from within the smaller human population. Therefore, the genetic differences among modern humans may reflect changes within the last 70,000 years, rather than gradual differentiation over hundreds of thousands of years. Other research has cast doubt on a link between Toba and a genetic bottleneck. For example, ancient stone tools in southern India were found above and below a thick layer of ash from the Toba eruption and were very similar across these layers, suggesting that the dust clouds from the eruption did not wipe out this local population. Additional archaeological evidence from southern and northern India also suggests a lack of evidence for effects of the eruption on local populations, leading the authors of the study to conclude, "many forms of life survived the supereruption, contrary to other research which has suggested significant animal extinctions and genetic bottlenecks". However, evidence from pollen analysis has suggested prolonged deforestation in South Asia, and some researchers have suggested that the Toba eruption may have forced humans to adopt new adaptive strategies, which may have permitted them to replace Neanderthals and "other archaic human species". Additional caveats include difficulties in estimating the global and regional climatic impacts of the eruption and lack of conclusive evidence for the eruption preceding the bottleneck. Furthermore, genetic analysis of Alu sequences across the entire human genome has shown that the effective human population size was less than 26,000 at 1.2 million years ago; possible explanations for the low population size of human ancestors may include repeated population bottlenecks or periodic replacement events from competing Homo subspecies. Some evidence points to genetic bottlenecks in other animals in the wake of the Toba eruption. The populations of the Eastern African chimpanzee, Bornean orangutan, central Indian macaque, cheetah, and tiger, all recovered from very low numbers around 70,000–55,000 years ago. The separation of the nuclear gene pools of eastern and western lowland gorillas has been estimated to have occurred about 77,700 years ago. The exact geographic distribution of anatomically modern human populations at the time of the eruption is not known, and surviving populations may have lived in Africa and subsequently migrated to other parts of the world. Analyses of mitochondrial DNA have estimated that the major migration from Africa occurred 60,000–70,000 years ago, consistent with dating of the Toba eruption to around 75,000 years ago. A study by Chad Yost and colleagues of cores from Lake Malawi dating to the period of the Toba supereruption showed no evidence of a volcanic winter, and they argue that there was no effect on African humans. In the view of John Hawks, the study confirms evidence from a variety of studies that the eruption did not have a major climatic effect or any effect on human numbers. ^ "Toba super-volcano catastrophe idea 'dismissed'". Bbc.com. Retrieved 2017-01-08. Choi, Charles Q. (2013-04-29). "Toba Supervolcano Not to Blame for Humanity's Near-Extinction". Livescience.com. Retrieved 2017-01-08. "The Toba Supervolcano And Human Evolution". Toba.arch.ox.ac.uk. Archived from the original on 2012-12-12. Retrieved 2013-08-05. ^ "The Geological Society : Super-eruptions" (PDF). Geo.mtu.edu. Retrieved 2015-03-28. Rose & Chesner 1987, p. 913; Zielinski & others 1996. ^ Oppenheimer 2002, p. 1593. ^ Jones 2007, p. 174; Rose & Chesner 1987, p. 913. ^ Petraglia & others 2007, p. 114; Zielinski & others 1996, p. 837. ^ Jones 2007, p. 174; Oppenheimer 2002. pp. 1593–1596. ^ Rampino & Self 1993a, passim. ^ Zielinski & others 1996, pp. 837–840. ^ Rampino & Self 1992, p. 52; Rampino & Self 1993a, p. 277. ^ Robock & others 2009 seem to agree on that. ^ Oppenheimer 2002, p. 1606. ^ Robock & others 2009. ^ Oppenheimer 2002, pp. 1593, 1601. ^ Self & Blake 2008, p. 41. ^ Zielinski & others 1996, p. 837. ^ Robock & others 2009 (page?). ^ "Doubt over 'volcanic winter' after Toba super-eruption. 2013". Phys.org. 2013-05-02. Retrieved 2013-08-05. ^ Lane, CS; Chorn, BT; Johnson, TC (2013). "Ash from the Toba supereruption in Lake Malawi shows no volcanic winter in East Africa at 75 ka" (PDF). Proceedings of the National Academy of Sciences. 110 (20): 8025–8029. Bibcode:2013PNAS..110.8025L. doi:10.1073/pnas.1301474110. PMC 3657767. PMID 23630269. Retrieved 2015-03-28. ^ Roberts, RG; Storey, M; Haslamc, M (2013). "Toba supereruption: Age and impact on East African ecosystems". Proceedings of the National Academy of Sciences. 110 (33): E3047. Bibcode:2013PNAS..110E3047R. doi:10.1073/pnas.1308550110. PMC 3746893. ^ Lane, CS (2013). "Reply to Roberts et al. : A subdecadal record of paleoclimate around the Youngest Toba Tuff in Lake Malawi". Proceedings of the National Academy of Sciences. 110 (33): E3048. Bibcode:2013PNAS..110E3048L. doi:10.1073/pnas.1309815110. PMC 3746898. ^ Jackson, LJ; Stone, JR; Cohen, AS; Yost, CL (2015). "High-resolution paleoecological records from Lake Malawi show no significant cooling associated with the Mount Toba supereruption at ca. 75 ka". Geology. 43 (9): 823–826. Bibcode:2015Geo....43..823J. doi:10.1130/G36917.1. ^ Ambrose 1998, passim; Gibbons 1993, p. 27; McGuire 2007, pp. 127–128; Rampino & Ambrose 2000, pp. 78–80; Rampino & Self 1993b, pp. 1955. ^ Ambrose 1998; Rampino & Ambrose 2000, pp. 71, 80. ^ "Science & Nature - Horizon - Supervolcanoes". BBC.co.uk. Retrieved 2015-03-28. ^ "When humans faced extinction". BBC. 2003-06-09. Retrieved 2007-01-05. ^ Rampino & Ambrose 2000, p. 80. ^ Ambrose 1998, pp. 623–651. ^ "Mount Toba Eruption – Ancient Humans Unscathed, Study Claims". Anthropology.net. 6 July 2007. Retrieved 2008-04-20. ^ Sanderson, Katherine (July 2007). "Super-eruption: no problem?". Nature. doi:10.1038/news070702-15. Archived from the original on December 7, 2008. ^ John Hawks (5 July 2007). "At last, the death of the Toba bottleneck". john hawks weblog. ^ See also "Newly Discovered Archaeological Sites in India Reveals Ancient Life before Toba". Anthropology.net. 25 February 2010. Retrieved 28 February 2010. ^ "Supervolcano Eruption In Sumatra Deforested India 73,000 Years ago". ScienceDaily. 24 November 2009. ^ Williams & others 2009. ^ Oppenheimer 2002, pp. 1605, 1606. ^ If these results are accurate, then, even before the emergence of Homo sapiens in Africa, Homo erectus population was unusually small when the species was spreading around the world. See Huff & others 2010, p.6; Gibbons 2010. ^ "New 'Molecular Clock' Aids Dating Of Human Migration History". ScienceDaily. 22 June 2009. Retrieved 2009-06-30. ^ Yost, Chad; et al. (March 2018). "Subdecadal phytolith and charcoal records from Lake Malawi, East Africa imply minimal effects on human evolution from the ∼74 ka Toba supereruption". Journal of Human Evolution. Elsevier. 116. ^ Hawks, John (9 February 2018). "The so-called Toba bottleneck didn't happen". john hawks weblog. Ambrose, Stanley H. (1998). "Late Pleistocene human population bottlenecks, volcanic winter, and differentiation of modern humans". Journal of Human Evolution. 34 (6): 623–651. doi:10.1006/jhev.1998.0219. PMID 9650103. Chesner, C.A. ; Westgate, J.A. ; Rose, W.I. ; Drake, R.; Deino, A. (March 1991). "Eruptive History of Earth's Largest Quaternary caldera (Toba, Indonesia) Clarified" (PDF). Geology. 19: 200–203. Bibcode:1991Geo....19..200C. doi:10.1130/0091-7613(1991)019<0200:EHOESL>2.3.CO;2. Gibbons, Ann (1 October 1993). "Pleistocene Population Explosions". Science. 262 (5130): 27–28. Bibcode:1993Sci...262...27G. doi:10.1126/science.262.5130.27. PMID 17742951. Gibbons, Ann (19 January 2010). "Human Ancestors Were an Endangered Species". ScienceNow. Goldberg, T.L. (1996). "Genetics and biogeography of East African chimpanzees (Pan troglodytes schweinfurthii)" (PhD). Harvard University, unpublished. Hernandez, R.D. ; Hubisz, M.J.; Wheeler, D.A. ; Smith, D.G. ; Ferguson, B.; et al. (2007). "Demographic histories and patterns of linkage disequilibrium in Chinese and Indian Rhesus macaques". Science. 316: 240–243. Bibcode:2007Sci...316..240H. doi:10.1126/science.1140462. PMID 17431170. Huff, Chad. D; Xing, Jinchuan; Rogers, Alan R.; Witherspoon, David; Jorde, Lynn B. (19 January 2010). "Mobile Elements Reveal Small Population Size in the Ancient Ancestors of Homo Sapiens". Proceedings of the National Academy of Sciences. 107 (5): 1–6. Bibcode:2010PNAS..107.2147H. doi:10.1073/pnas.0909000107. PMC 2836654. PMID 20133859. Jones, S. C. (2007). "The Toba Supervolcanic Eruption: Tephra-Fall Deposits in India and Paleoanthropological Implications". In Petraglia, M. D.; Allchin, B. (eds.). The Evolution and History of Human Populations in South Asia. Springer. pp. 173–200. ISBN 1-4020-5561-7. Luo, S.-J. ; Kim, J.-H.; Johnson, W.E. ; Van der Walt, J.; Martenson, J.; et al. (2004). "Phylogeography and genetic ancestry of tigers (Panthera tigris)". PLoS Biology. 2 (12): 2275–2293. doi:10.1371/journal.pbio.0020442. PMC 534810. PMID 15583716. Luo, Shu-Jin; Zhang, Yue; Johnson, Warren E.; Miao, Lin; Martelli, Paolo; et al. (2014). "Sympatric Asian felid phylogeography reveals a major Indochinese-Sundaic divergence". Molecular Ecology. 23 (8): 2072–2092. doi:10.1111/mec.12716. ISSN 0962-1083. McGuire, W.J. (2007). "The GGE Threat: Facing and Coping with Global Geophysical Events". In Bobrowsky, Peter T.; Rickman, Hans (eds.). Comet/Asteroid Impacts and Human Society: an Interdisciplinary Approach. Springer. pp. 123–141. ISBN 3-540-32709-6. Ninkovich, D.; N.J. Shackleton; A.A. Abdel-Monem; J.D. Obradovich; G. Izett (7 December 1978). "K−Ar age of the late Pleistocene eruption of Toba, north Sumatra". Nature. 276 (5688): 574–577. Bibcode:1978Natur.276..574N. doi:10.1038/276574a0. Petraglia, M.; Korisettar, R.; Boivin, N.; Clarkson, C.; Ditchfield, P.; et al. (6 July 2007). "Middle Paleolithic Assemblages from the Indian Subcontinent Before and After the Toba Super-eruption". Science. 317 (5834): 114–116. Bibcode:2007Sci...317..114P. doi:10.1126/science.1141564. PMID 17615356. Rampino, M. R.; Ambrose, S. H. (2000). "Volcanic winter in the Garden of Eden: The Toba supereruption and the late Pleistocene human population crash" (PDF). In McCoy, F. W.; Heiken, G. (eds.). Volcanic Hazards and Disasters in Human Antiquity. Boulder, Colorado: Geological Society of America Special Paper 345. doi:10.1130/0-8137-2345-0.71. ISBN 0-8137-2345-0. Rampino, Michael R.; Self, Stephen (2 September 1992). "Volcanic Winter and Accelerated Glaciation following the Toba Super-eruption" (PDF). Nature. 359 (6390): 50–52. Bibcode:1992Natur.359...50R. doi:10.1038/359050a0. Archived from the original (PDF) on 20 October 2011. Rampino, Michael R.; Self, Stephen (1993). "Climate–Volcanism Feedback and the Toba Eruption of ~74,000 Years ago" (PDF). Quaternary Research. 40: 269–280. Bibcode:1993QuRes..40..269R. doi:10.1006/qres.1993.1081. Archived from the original (PDF) on 2011-10-21. Rampino, Michael R.; Self, Stephen (24 December 1993). "Bottleneck in the Human Evolution and the Toba Eruption". Science. 262 (5142): 1955. Bibcode:1993Sci...262.1955R. doi:10.1126/science.8266085. PMID 8266085. Robock, A.; Ammann, C.M. ; Oman, L.; Shindell, D.; Levis, S.; Stenchikov, G. (2009). "Did the Toba Volcanic Eruption of ~74k BP Produce Widespread Glaciation?". Journal of Geophysical Research. 114: D10107. Bibcode:2009JGRD..11410107R. doi:10.1029/2008JD011652. Rose, W.I. ; Chesner, C.A. (October 1987). "Dispersal of Ash in the Great Toba Eruption, 75 ka" (PDF). Geology. 15 (10): 913–917. doi:10.1130/0091-7613(1987)15<913:DOAITG>2.0.CO;2. Self, Stephen; Blake, Stephen (February 2008). "Consequences of Explosive Supereruptions". Elements. 4 (1): 41–46. doi:10.2113/GSELEMENTS.4.1.41. Steiper, M.E. (2006). "Population history, biogeography, and taxonomy of orangutans (Genus: Pongo) based on a population genetic meta-analysis of multiple loci". Journal of Human Evolution. 50: 509–522. doi:10.1016/j.jhevol.2005.12.005. PMID 16472840. Thalman, O.; Fisher, A.; Lankester, F.; Pääbo, S.; Vigilant, L. (2007). "The complex history of gorillas: insights from genomic data". Molecular Biology and Evolution. 24: 146–158. doi:10.1093/molbev/msl160. PMID 17065595. Williams, Martin A.J. ; Stanley H. Ambrose; Sander van der Kaars; Carsten Ruehlemann; Umesh Chattopadhyaya; Jagannath Pal; Parth R. Chauhan (30 December 2009). "Environmental impact of the 73 ka Toba super-eruption in South Asia". Palaeogeography, Palaeoclimatology, Palaeoecology. Elsevier. 284 (3–4): 295–314. doi:10.1016/j.palaeo.2009.10.009. Zielinski, G.A. ; Mayewski, P.A. ; Meeker, L.D. ; Whitlow, S.; Twickler, M.S. ; Taylor, K. (1996). "Potential Atmospheric Impact of the Toba Mega‐Eruption ~71,000 years ago" (PDF). Geophysical Research Letters. 23 (8): 837–840. Bibcode:1996GeoRL..23..837Z. doi:10.1029/96GL00706. Archived from the original (PDF) on July 18, 2011. Geography Predicts Human Genetic Diversity ScienceDaily (Mar. 17, 2005) – By analyzing the relationship between the geographic location of current human populations in relation to East Africa and the genetic variability within these populations, researchers have found new evidence for an African origin of modern humans. Out Of Africa – Bacteria, As Well: Homo Sapiens And H. Pylori Jointly Spread Across The Globe ScienceDaily (Feb. 16, 2007) – When man made his way out of Africa some 60,000 years ago to populate the world, he was not alone: He was accompanied by the bacterium Helicobacter pylori...; illus. migration map.